Cherkizovo Group highlighted inflation in Russian meat prices, spurred by a fall-off in slaughter rates and an increasing squeeze on imports, which may lead to a stagnation in consumption this year. Sales prices achieved by the protein giant for processed meats soared 12%, in rouble terms, in the first half of the year, compared with the same period in 2010, with chicken and poultry prices showing smaller rises. 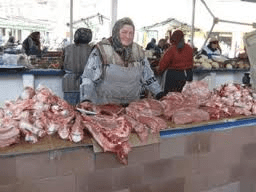 The increases were also evident quarter on quarter, with prices achieved by Cherkizovo for pork in the April-to-June period averaging 6% higher than in the first three months of the year. Russian meat prices have risen this year in part thanks to a reduction in slaughter rates, after last year’s drought prompted many farmers to liquidate flocks and herds rather than bear the expense of feeding them through the winter with grain at historically high prices. However, prices are also seen as being supported by the country’s increasing restrictions on meat imports, whose large quantities have prompted Russia to embark on a programme of stimulating domestic consumption. Vladimir Putin, the Russian prime minister, last week revealed plans to cut imports of pork and poultry in 2012 by more than one-quarter, with the 350,000 tonnes of poultry that will be allowed in representing the different between domestic production, estimated at 3.15m tonnes, and consumption, pegged at 3.5m tonnes. The volumes will be controlled through strict use of quotas, which for poultry were separated into plain and minced meat allowances. For pork, import quotas were cut by 32% to 320,000 tonnes for 2012. Russia’s meat import policies have proved controversial both among exporters, with the US pressing for a higher pork export allowance, and within the country. The Kommersant newspaper said that farm ministry data estimate that domestic pork production will increase by only 100,000-120,000 tonnes in 2012, short of the 152,000 tonnes that has been axed from the import quota. Arable farmers, meanwhile, have reported dissatisfaction at the protection given to the meat industry through, for example, the grain export quotas introduced last year which kept feed bills in check but prevented growers cashing in on high international crop prices. Sergey Yusghin, the head of the executive committee at Russia’s National Meat Association, said that meat consumption will remain this year at last year’s 67 kilogrammes per capita, checked by price rises. A drop in beef consumption will offset rises in pork and poultry demand. Cherkizovo said its own poultry volumes had soared 18% in the first half of 2011 to 118,000 tonnes, lifted by growth in production capacity. Pork volumes were flat at 41,000 tonnes. The group had delivered "strong results across all segments", Sergei Mikhailov, the Cherkizovo chief executive said. Cherkizovo depositary receipts, a proxy for shares, stood 0.6% lower at $19.62 in late deals in London.